Happy Bhogi, Pongal and Sankranthi! Three-in-One Wishes 😛 Here’s wishing everyone a crackling Bhogi, a Happy Pongal and a Cheerful Makar Sankranthi! Today is the first day of Pongal and is traditionally celebrated as Bhogi. I’ve observed that it is less common in Hyderabad as compared to in Vizag or in my hometown. Bhogi is celebrated by throwing away or destroying old clothes and materials by setting them on fire, signifying the end of the old and the emergence of the new. It is celebrated with much fervor and gaiety. I remember the days when we used to get up as early as 4 AM to light the bonfire and tumble in all sorta old materials – logs, broken furniture, wood chips, dry leaves etc. Once the flames die down, we’d plant kandamullam or sweet potatoes amongst the embers/coals and let them roast….to be eaten later. Mmmmm! This entry was posted in Awareness, Festivals, Fun, Hyderabad, India, Info, Life, Reminiscence and tagged Bhogi, Indian Festivals, Kites, Pongal, Sankranthi. Bookmark the permalink. 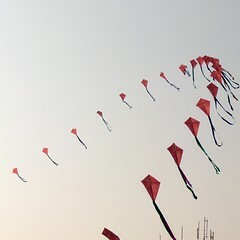 Hi this is kolam..Kite Festival is the more popular mode of celebrating Pongal here and though I like watching those myriad colored kites fluttering about in the skies, the art of flying them has been long forgotten!